It’s a cephalobration for Cephalopod Week!! That’s right, we are entangling ourselves in these amazing marine invertebrates who I just love to paint and draw! 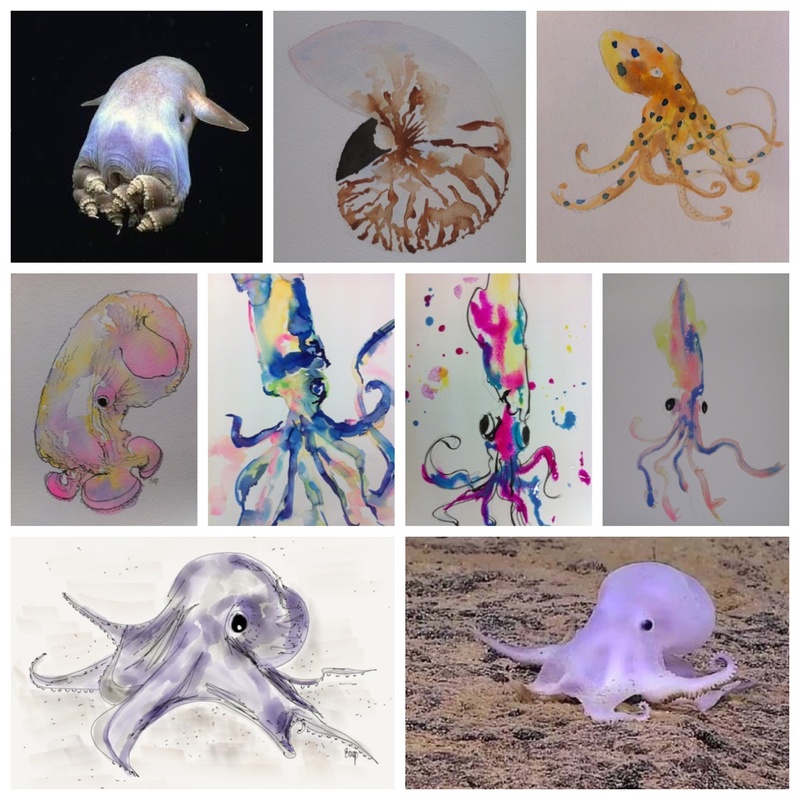 As you can ‘sea’ from my Cephalopod Squad these sea creatures come in many different shapes and sizes and are equipped with many special creature features! For example, the octopus has three hearts, blue blood and has the amazing ability to change colour instantly. Squid on the other hand swim backwards and shoot ink when threatened. And then there is the beautiful chambered nautilus, the living fossils of the ocean, which move by jet-propulsion! Now that’s eight or more reasons to love cephalopods and join My Cephalopod Squad!! My cephalopod artworks are as different as the creatures themselves and include watercolours, pen and watercolours, pen and ink and my first ever digital drawing of ‘Casper’ the octopus which I created with my Apple iPad pro and pencil using the Paper 53 app. This illustrates how I am using STEAM (Science, Technology, Engineering, Arts & Mathematics) in my visual storytelling about the wonders of our ocean, so please contact me if you are interested in my creative science and education. You can also follow my creative marine journey via my alter ego Dr Suzie Starfish on Facebook and @suepillans on Twitter and Instagram.